Being that time of year again, I decided to look back at 2014 to try to find something I could be thankful for. Aside from a few movies, and one or two games (BTW, look forward to my Top 5 Lists at the end of December. Might as well end 2014 the way everyone else will...), 2014 hasn't been that great of a year. Scandals from sports associations, celebrities, the US justice system, corporations being, well, corporations (THANKS AGAIN, Time Warner, Comcast, etc. ); this year can't be gone quickly enough, especially considering we're getting sequels to Jurassic Park, Star Wars, Terminator, AND Mad Max in one year! But with 2015 coming up, there is one game I have to voice my opinion one, one game that always gets a strong reaction from anyone who plays it: Destiny. Console exclusive content that feels like robbery, a currency system that flat out doesn't make sense, a gear XP system that encourages wearing armor that you probably won't like, multiplayer that despite being the best aspect of the game feels MORE balanced when you're playing the "unbalanced" Iron Banner events. And my biggest complaint, a story that just doesn't exist (I don't mean it's bad, it PLAIN JUST ISN'T THERE). I and many of you could go on about this game until the sequel comes out, or at least until the next update that fixes as many problems as it creates is implemented. Yes, this is one of the most controversial games that was released this year, but instead of said controversy coming from glitches or questionable content, it's primarily from the inescapable sense that Bungie just didn't put much thought into god knows how many aspects of the game. I was about to completely write this thing off, until I stumbled upon the website this article is about, and entered the Vault of Glass. And... goddammit it, it's great. It's easily the best part of the game: a near perfect mix of strategy, highlighting and utilizing the game's mechanics to their best effect, and effectively requires communication between players in order to win. It's the one thing in this game that truly feels like an MMO, and my experience is all thanks to a Kotaku commentator who dropped the site's name, and the five other blokes who helped a first time raider through the vault. After three and a half hours, countless deaths, and nearly bagging it due to sleepiness and a dying controller, I... (sigh) got an assault rifle I really don't care for, and the Chatterwhite shader. And I can't wait to do it again. As you all know, there's no matchmaking system for the raids. Well, not an official, built in one at least. However, there's destinylfg.net. 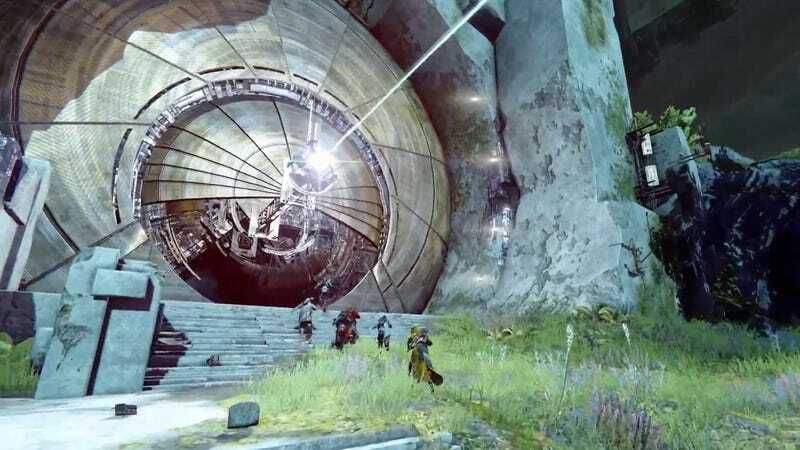 If you're reading this, haven't got into a raid, want to do one, and have plenty of time to kill, stop reading this and go to destinylfg.net right now. You can find a group in a matter of minutes, and it's not just for raids; there are groups there for weekly strikes, and... actually, those are the two things I can think of that need matchmaking but don't have it.